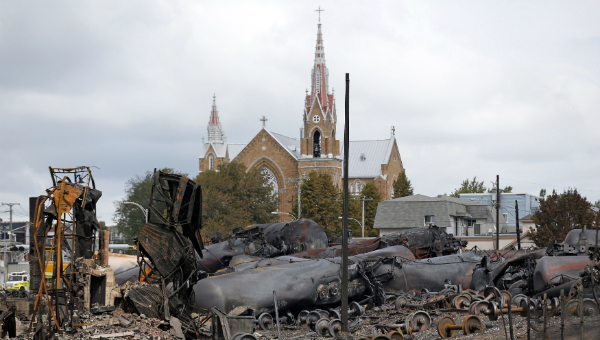 Lac-Megantic, Quebec (dpa) – Maude Verreault owes her life to a cigarette. She darted across the street and heard an explosion behind her. The tracks pass just a few meters behind the building that housed the Musi-Cafe. The 73-car runaway train with no driver on board was carrying highly flammable light crude oil from North Dakota for a refinery in New Brunswick. It derailed at about 1:15 am, causing at least six powerful explosions and an intense fire that levelled about 30 buildings in the heart of the lakeside community about 250 kilometres east of Montreal. About 2,000 people were forced from their homes as emergency services evacuated central neighbourhoods. On Tuesday, some 1,200 evacuees were allowed to come back to their homes. Police investigators recovered two more bodies from the rubble, bringing the confirmed death toll to 15. About 40 people are still missing. Verreault thinks most of them were at Musi-Cafe, one of the most popular hangout spots in the tightly knit community of 6,000. “There must have been about 40 to 50 people inside, when I went out to smoke,” Verreault told dpa as she shared a cigarette with her best friend and fellow survivor, Karine Blanchette. Musi-Cafe was the place to be, said Blanchette, 35, who also worked there as a waitress. Blanchette, 35, a part-time actress who was performing in a play that night, said she survived because she couldn’t find a parking spot in front of the restaurant, where she had planned to meet friends. Blanchette said her first thought was about her friends inside. “I kept dialling the number at the restaurant but the line was down,” she said. Later, she managed to join Verreault and despite the danger and the mayhem around them, the two friends decided to go back. “I couldn’t sit home while my friends burned alive,” Blanchette said. The heat was too intense, and they were forced to turn back. Both live beyond the fire zone, but they have gone to the shelter regularly to help out. As police investigators and forensic scientists sift through the rubble in search of more victims, Blanchette said they have to accept that they’ll never see their friends again and must start piecing their lives together. Verreault said dismantling the railway that cuts through the town would be a good start. “I want to melt the damn thing and build a memorial to my friends in its place,” Verreault said.